For workplaces that have dedicated rooms for first aid treatment, or an area where risk is particularly high, it may be best to keep first aid items in a designated storage facility. 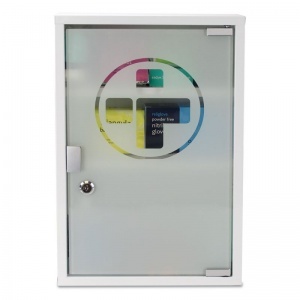 The Medium Workplace First Aid Kit Plus in Metal Cabinet with Glass Door is an ideal central storage facility to provide employers and staff peace of mind. Sometimes, a simple first aid kit won't suffice, and you need an allocated area (or multiple areas) for your emergency supplies. 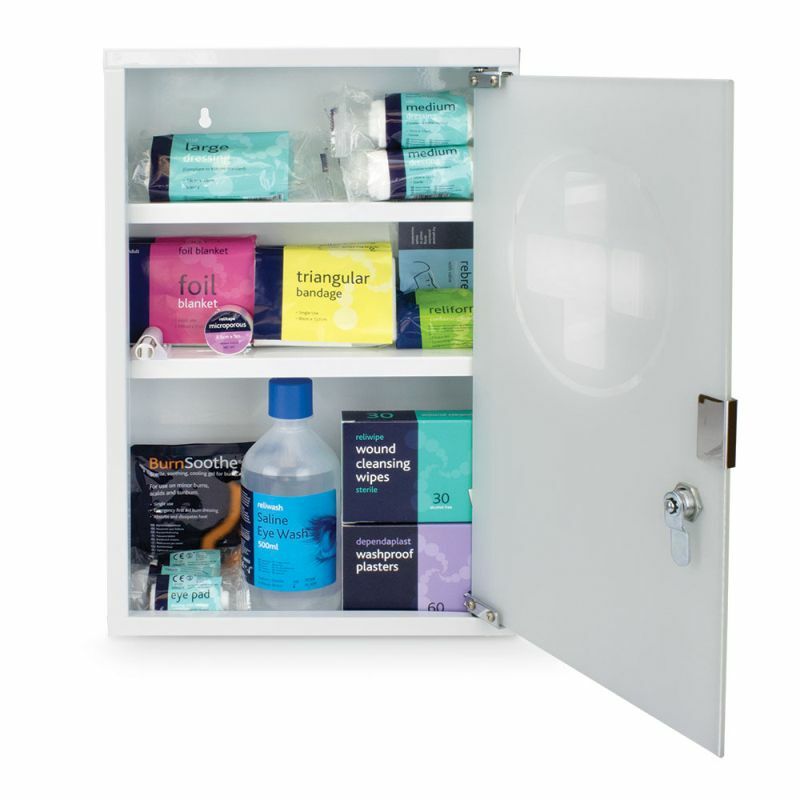 The contents of this fully stocked first aid cabinet are based on the medium size version of the new British Standard of Workplace Kits, such as the Medium Workplace First Aid Kit. What is Included in the First Aid Plus Cabinet? Finished in white enamel and protected by a strong glass door, this cabinet will provide an extra measure of security, as it comes with two keys to lock away your items for extra protection. The cabinet is ready to mount onto the wall and is available fully stocked as illustrated. Purchase as many cabinets as you need depending the level of risk at your site, be it low (one kit per 100 employees) or high (one kit per 25 employees). With the increased first aid quantities, plus the addition of the eye wash and 20 extra plasters, this cabinet will ensure you will have a well-prepared first aid post exceeding the basic requirements. The Medium Workplace First Aid Kit Plus in Metal Cabinet with Glass Door is usually dispatched via First Class Royal Mail and delivery should be within 1 to 3 working days.